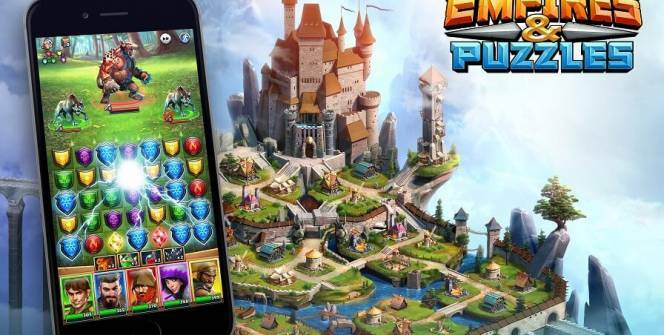 Empires & Puzzles is an innovative title which combines traditional RPG gameplay with match 3 style puzzles. 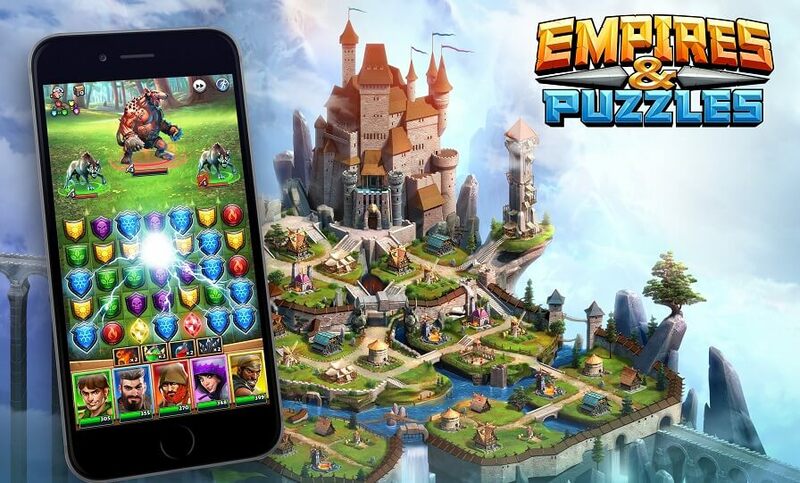 So if you’re looking to download an addictive new game which is like no other game you’ve ever played before, simply continue reading to discover some of Empires & Puzzles key features. In order to excel at Empires & Puzzles RPG challenges, you’ll need to match rows of matching symbols in Empire & Puzzle’s in-game match 3 puzzles in order to be able to send your troops into battle. Remember that the more rows of symbols you successfully match the more magical troops you’ll be able to summon into battle. 1. You’ll be able to take on mighty titans with the help of your friends. As Empires & Puzzles offers a multiplayer mode you’ll be able to recruit your real life friends in order to help you take down powerful titans. If none of your friends are gamers, don’t worry as you’ll be able to take on Titans with the help of in-game friends. 2. You’ll be able to raid resources by playing Empires & Puzzles player vs player mode. Once you’ve got the hang of Empires & Puzzles: RPG Quest innovative gameplay, you’ll be able to test your puzzle skills against other players in Empires & Puzzles player vs player mode. 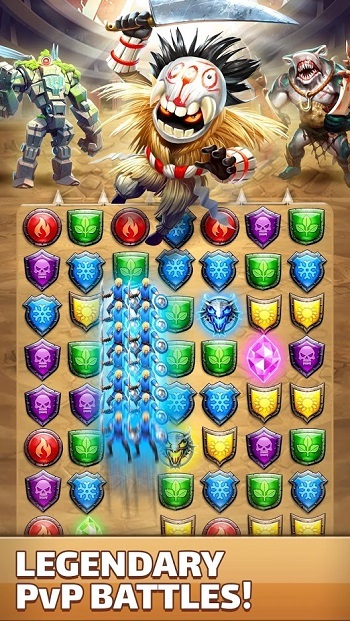 It’s well worth battling as many players as possible as the more matchups you win, the more resources you’ll be able to steal from your defeated foes. 3. There are hundreds of unique heroes which you can collect and command. As you progress through Empires & Puzzles you’ll start to unlock new heroes each of which will offer different strengths, which you’ll be able to use to your advantage in battle. Better yet, you’ll also be able to use the resources which you win in order to upgrade your favorite heroes and to take on more formidable enemies. 4. Empires & Puzzles features dozens of different combos which you can use to defeat your foes. The more time you spend playing Empires & Puzzles the more combos you’ll figure out and will be able to use in battle. So it’s well worth taking note of the combos which you manage to activate. 5. There are hundreds of ferocious monsters to defeat. As well as being able to fight human players in order to level up, you’ll also be able to take on hundreds of ferocious monsters. Each of which will be more terrifying than the last. So you can expect Empires & Puzzles to keep you thoroughly entertained for hundreds of hours! 6. Empires & Puzzles offers clear high-resolution graphics. If you’re a bit of a snob when it comes to games graphics, you won’t be disappointed by Empires & Puzzles as it offers crystal clear, high-resolution graphics. So if you’re looking for an innovative new game to play, which transcends genres, it’s well worth giving Empires & Puzzles a go. Especially if you’re a fan of RPG, 3v3 and strategy style games. Sometimes when playing Empires & Puzzles, bluestacks ask you fee to pay but gives you option to download some apps. Every time it asks you just select “Install apps” and continue using it free. I hope you enjoyed this article, please rate and share. If you have problems running Empires & Puzzles on your desktop or any other issues, leave a comment below.